Britian& #39;s biggest piece of public art: At 115 metres high, the steel tower will be taller than the Statue of Liberty in New York. More than 120 years after Gustave Eiffel built the steel lattice that came to symbolize Paris, London is taking on the City of Light with the Colossus of Stratford — at least, that is one of the names the capital’s mayor has in mind. The Olympics Minister Tessa Jowell sees Anish Kapoor’s work as a way of making the site of the 2012 Games stand out. East London will have the largest and most ambitious artwork in the country: a startling red tower that looks like a mangled rollercoaster. It is too early to tell what the world will call this £19.1 million, 115m-tall (377ft) feat of technological and industrial wizardry, but another of the mayor Boris Johnson’s favorite titles is The Hubble-Bubble. Kapoor beat competition from the artist Antony Gormley and the architects Caruso St John to win the mayor’s contest to find yet another “iconic symbol” for the city and the Olympic Park. Detailed plans were revealed yesterday at the Greater London Assembly headquarters. 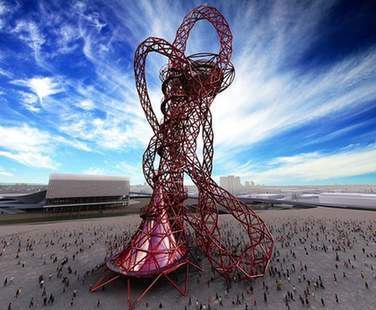 Officially the structure, which will be 22m taller than the Statue of Liberty and more than twice the height of Nelson’s Column, is called the ArcelorMittal Orbit. It is named after the steel company owned by Lakshmi Mittal, the richest man in Britain, who is paying most of the cost — and planting a giant advert in the Olympic site. However Mr Johnson immediately bombarded his new landmark with a fusillade of alternative names. Whatever it ends up being called, the Orbit is the latest and priciest example of a vogue for gargantuan public art commissions, begun by Gormley’s Angel of the North in 1998 and continuing now with Mark Wallinger’s planned 50m tall horse near the Eurostar terminal at Ebbsfleet in Kent. Mr Johnson said that £3.1 million of the cost would be borne by the Greater London Authority, with Mr Mittal picking up the rest. “I know very well that there will be people who say we are nuts, we are barmy in the depths of a recession to be building Britain’s biggest ever piece of public art,” he said. However, although the Olympics area already had the stadium, the aquatics centre and a giant shopping mall, he and Ms Jowell had long felt that “we needed to give that site something extra, something to distinguish the East London skyline, something to arouse the curiosity and wonder of Londoners and visitors alike”. They needed money to make it possible, and steel, so Mr Johnson was overjoyed to find himself sharing a cloakroom with Mr Mittal at Davos in January 2009. The meeting lasted 45 seconds. Mr Mittal said that Mr Johnson spoke for all of them but by the end of it they had a deal. The Mayor rebutted suggestions that the structure would be an improper incursion of corporate branding into public life, pointing out that Olympics rules meant it could not carry the company name during the Games. Mr Kapoor said he wanted to take on the Eiffel Tower and the memory of the “bird’s nest stadium” from the last Olympics by trying to “rethink” the idea of a tower. Lifts and a walkway will enable 800 people an hour to get to the top, where there will be a restaurant and viewing platform.